I recently built a large sand pit in order to cast cement and make large concrete sculptures. 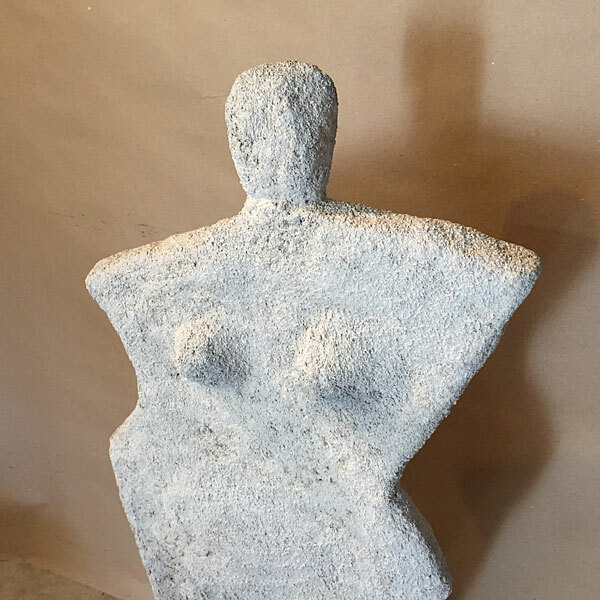 Although many of my concrete sculptures have been either hand-formed over a metal armature or cast from a form I made, I was anxious to try a new method. The idea of casting in sand is not as new one, but it does give a sense of freedom and flexibility to a sculpture. It has been a trial and error process, whereby I have had a few surprises. I usually have an idea of a shape to start out with and then I wing it from there. I love the texture of concrete and the addition of casting in sand gives an even added texture that reminds me of stone. Since I don’t plan on chipping away at stone any time soon, this satisfies my desires for texture. Sometimes it is difficult to put one’s paintings into a category. Although my work can be defined as abstract, it can also be defined as intuitive. Intuitive, meaning that there is no plan when I start the painting process. I just dip my brush and go. 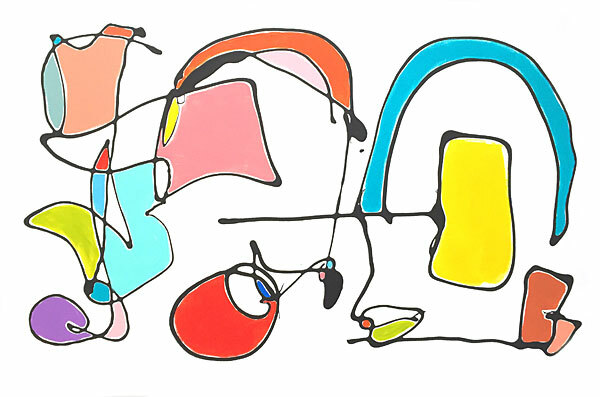 But there is another defining feature about my paintings and that is the free-flowing lines with a palette of happy colors. These can be termed lyrical abstracts. 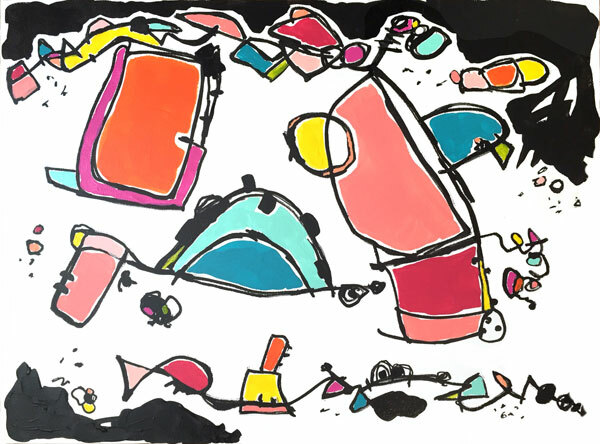 Lyrical abstracts share the aspects of being imaginative, emotive, expressive, passionate and subjective. There is often an underlying emotion that the artist is trying to convey. In my respect, the paintings can overwhelmingly impart a sense of joy and happiness. One of the earliest well-known artists to be considered to paint lyrical abstracts is Wassily Kandinsky. There is almost a romantic feel to many lyrical abstracts. Even though I am painting in an intuitive manner, it is almost like there is a symphony taking place, as one color takes over the composition from the other. It is a totally enjoyable process and the results are very rewarding. I believe my hand is very influenced by the fact that I have always been a very positive and happy person. I also believe that my style is influenced, somewhat, by the fact that my father was a musician and an orchestra leader. 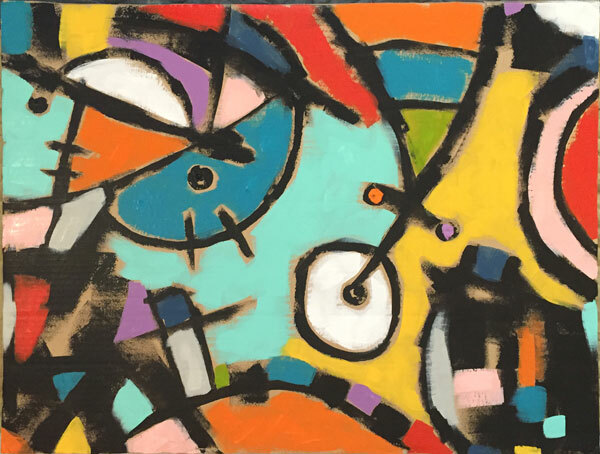 My paintings often remind me of musical compositions. If you have been following along with my art career, you have certainly noticed that my path of creating art branches out in many directions. Although my focus remains on both paintings and sculpture, my sculptures vary according to my choice of materials. 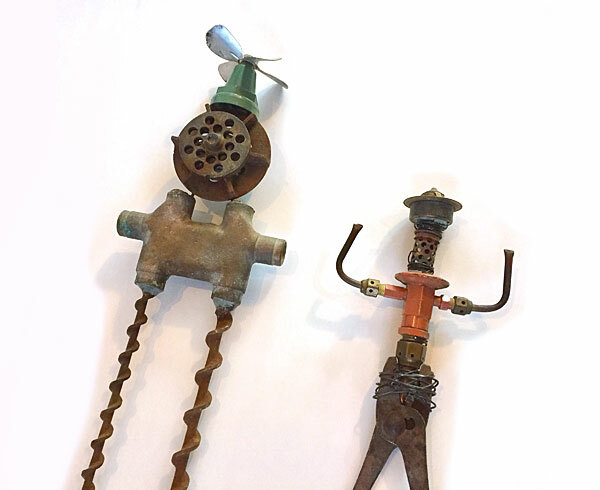 Since I have always had an interest in finding unusual items that might work well when worked into a sculpture, one of my main series of sculptures are made from found objects. 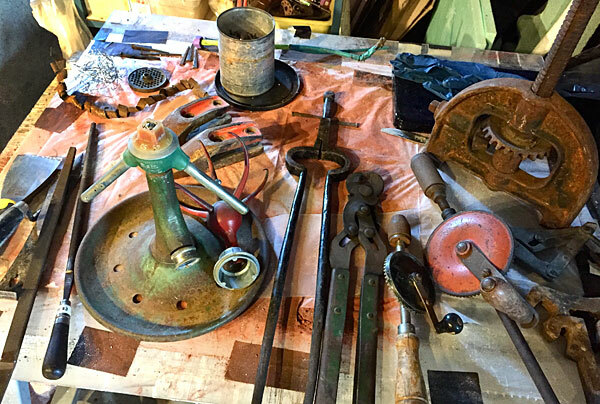 Most of the pieces I am drawn to are old metal, often auto parts or other industrial castoffs. I’m a known junkyard junkie who will never turn down a trip to a junkyard or other similar place to find castoff items. You just never know what unique part will be waiting right around the next corner or on the next trip in search of pieces for sculptures. It often takes years to find the right, compatible objects to make the sculpture that speaks to me. I’m not interested in making “cute” critters but real art objects. Many trips to the outdoor studio and lots of trial with items, along with many days thinking about the design, finally helps a sculpture come to life. Sometimes some of the found objects just seem meant for each other in a short period of time. But many times, pieces are partly paired together, waiting on my workbench until the last few pieces are “found’. It’s a totally different thought process and working process from sculptures made from cement or plaster. But once a sculpture comes together, it is like a birth of sorts. Since I am not currently a welder, I often make cement bases with metal/ rebar extending from them to attach the sculpture. I then, usually, wire and epoxy pieces firmly together. 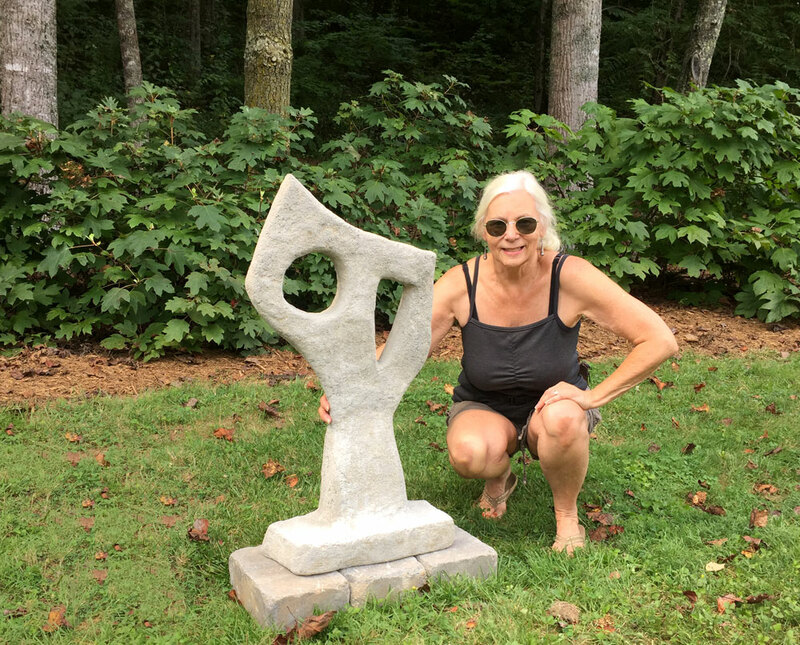 For the past five years, I have been working with cement to create both large and small sculptures. Most of these have been built around an armature that I make prior to adding cement. Some of the smaller, concrete sculptures are cast from forms that I design, occasionally adding colored glass. Recently I have been casting concrete in a sandpit that we made from a wood form and then filled with lots and lots of sand. The forms are first designed on paper and then, after may sketches, are then dug out in wet sand. There are challenges, as the sand is not a firm material to work with. You must also be able to think well in regard to spatial relationships. As you dig, you need to think about the positive and negative spaces, and what area is going to get filled with the concrete. The first sandcast sculpture I attempted was a rather simple shape, just so I could get a feel for the process. It actually turned out better than I had hoped for. But there is a lot of pre-planning necessary to making a cement sculpture. One of the most important things to consider is the weight of your piece and what type of base you will use. Things that have to be considered when working with cement are: weather, temperature, humidity and when to uncast a piece. I usually uncast a piece within 24 hours and then do most of the finish work before the sculpture is too hard to work with. There is a 28 day period to consider, when the cement gets harder by the day until that point. I have tons of sketches that I want to sandcast, and others that will be cast in forms or hand-formed. There is something so organic and textural that continues to draw me back to the cement. A few weeks ago I got it into my head to try painting on cardboard. It has been such a fun adventure. I almost can’t stop myself from painting on any piece of cardboard I can find. I love the texture of the bumps and lines that form when I start painting the cardboard. Although I know that this is not the most stable surface to paint on for archival purposes, I have been doing a bit of research. If gel medium is used to coat all surfaces this forms a good barrier prior to painting. And I am so delighted that the little dimples and bumps still appear. I can experiment more freeely. I am also recreating the look of painting on cardboard on my large canvases. Everything is about the same except for the texture.